IN 1941, LIFE MAGAZINE FEATURED A cover story on one of the Ozarks' top tourist attraction - a float fishing trip down the White River. Ten-day, 65-mile floats in 20' foot wooden jon boats included overnight camping on gravel bars and some of the finest smallmouth bass fishing in the world. The Ozark Mountains of Arkansas and Missouri are recognized as the birthplace of commercial float fishing, according to A.J. McClane's New Standard Fishing Encyclopedia. In the 25 years after that Life magazine story, five major hydropower dams were built on the White River and two of its tributaries. Hundreds of miles of prime smallmouth bass habitat were destroyed, and some of the more popular float trips suddenly had dams and lakes stuck in the middle of them. But 168 miles of cold, tailwater trout streams were created in their place. The result was a great trout experiment that has produced two world record brown trout—a 38-pound, 9-ounce fish in 1988 from the Norfork Tailwater and the current record 40-pound, 4-ounce brown trout caught in 1992 from the Greers Ferry Tailwater. Today, an angler can sample some of the old—free-flowing Ozark streams with excellent smallmouth bass fishing—and some of the new—world class trout fishing on Ozark tailwaters. Plus there is an abundance of warm water fishing opportunities in the clear lakes created by these dams, for everything from black bass to stripers to walleye. Through all this change in the Ozarks, one thing has remained constant—the popularity of float fishing. McClane explained best the advantages for the angler: "The leisurely pace of floating not only extends your range but permits you to be on the productive pools at key hours. For nocturnal gamefish like brown trout, walleye, and largemouth bass, a gravel bar camp is at least half the secret in getting the most out of civilized streams." Although one-day wade-fishing trips are the norm, like everywhere else, the opportunities for all-day and overnight float trips abound and shouldn't be overlooked by a first-time visitor to the Ozarks. Fayetteville, Arkansas, site of the 1996 Trout Unlimited convention, is a prime spot to begin an adventure into Ozark angling. It is located near the headwaters of the White River in the northwest corner of the state. All five tailwater trout fisheries are within 200 miles. By following the path of the White River, you can examine the multitude of fishing opportunities. The White River begins in the Boston Mountains of Arkansas, where three other major White River tributaries also have their beginnings—War Eagle Creek, Kings River, and Buffalo River. War Eagle Creek joins the White River in the headwaters of Beaver Lake, near Fayetteville. The river is flowing north, toward Missouri, at this juncture. Beaver Dam stands only 17 miles from the Arkansas-Missouri line. The Beaver Tailwater is just eight miles long, but it is heavily stocked, with rainbows and brown trout primarily, but also cutthroats and brookies, like the other Arkansas tailwaters. All four trout species are able to successfully spawn in the Ozarks, but the brown trout, in particular, are thriving through natural reproduction in the tailwaters. It is these "monster browns" that have earned the Ozark tailwater fisheries their reputation. 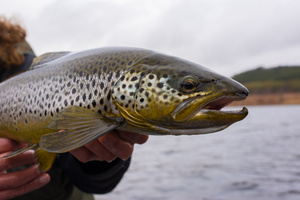 Even the Beaver Tailwater, which is known for its rainbows, has produced a few 10-pound brown trout and a 20-pounder was caught and released in an Arkansas Game and Fish Commission (AGFC) electrofishing sample in 1994. A 1995 electrofishing study showed over 7,500 trout per mile in this section of the White River, with good numbers of brown trout over 16 inches. The Beaver Tailwater also features a one-mile catch-and-release section, where artificial lures and barbless hooks are required. In part thanks to the work of the Arkansas Council of Trout Unlimited, The AGFC added catch-and-release sections to the Beaver, Bull Shoals, Norfork and Greers Ferry tailwaters on Jan. 1, 1995, and the effects were noticed almost immediately. "Our spring and summer electrofishing samples in 1995 showed a five- to ten-fold increase in the number of rainbow trout over 16 inches in the catch-and-release zones," said AGFC trout biologist John Stark. "They are really making a big difference." Soon after the White River crosses the Arkansas-Missouri border, it is joined by the Kings River, in the headwaters of Table Rock Lake. A new smallmouth bass management plan, begun Jan. 1, 1996, designates the Kings River as one of three "Ozark Quality Streams." Table Rock Dam stands near the rapidly growing Ozark entertainment capital of Branson, Mo. The tailwater is called Lake Taneycomo because of a small, turn-of-the-century hydropower dam, located 22 miles below Table Rock Dam, created a lake long before the big Corps of Engineers projects. Although Missouri's Shepherd of the Hills Hatchery, located along the White River just below Table Rock Dam, stocks over 700,000 trout per year here, mostly rainbows, brown trout have been the "big-fish story," like in other Ozark tailwaters. A 23-pound, 4-ounce brown from Lake Taneycomo set a new Missouri record in 1991, and the mark was broken with a 24 pound, 15-ounce brown trout in 1994. The White River flows back into Arkansas where Bull Shoals Dam creates the biggest lake in the White River system, 71,000 acres. The combination of this big hydropower dam, which holds eight power generation turbines, and the closeness of Norfork Dam, on the White River tributary of the North Fork River, creates 100 miles of trout habitat below Bull Shoals Dam. When trout anglers refer to the White River, most often they are referring to the Bull Shoals Tailwater, which supports more fishing resorts and fishing guides than all the other Ozark tailwaters combined. Data collected in 1993-94 showed this section of the White River held 188 brown trout per mile in excess of five pounds. "I've never seen water anywhere I've ever gone that has the richness of this water, as far as the quality of the fish it grows and how fast it grows them," said world-renowned fly fishing authority Dave Whitlock, whose fly fishing school is located in nearby Midway, Arkansas. Contributing to that water quality here are White River tributaries of Crooked Creek and the Buffalo River. The Buffalo River narrowly escaped damming by the Corps of Engineers. In 1972 Congress officially preserved it as a free-flowing stream by designating it the first "national" river in the U.S. Crooked Creek and the Buffalo River are the two best smallmouth bass streams in Arkansas. And the Buffalo remains as an awe-inspiring example of what White River float trips were like before the dams were built. The North Fork River flows into the White River 44 miles below Bull Shoals Dam. The Norfork Dam Tailwater is only 4.8 miles long but exerts a big influence on the White River. The Norfork National Fish Hatchery located here produces about 500,000 pounds of trout annually and ranks as the No. 1 coldwater hatchery in the U.S. Fish and Wildlife Service—but once again, it is the Norfork's big browns that have made it famous. Nutrient-enriched water from the hatchery and the booster shot of cold water from Norfork Dam are two important factors in extending the White River's trout habitat another 60 miles downstream. And this small tailwater has produced some legendary big-fish stories. In August 1988, three brown trout over 30 pounds were caught from the Norfork Tailwater, including a 38-pound, 9-ounce fish that was recognized as a new world record by the National Fresh water Fishing Hall of Fame. Now another White River system tailwater holds that record. In 1992, Howard "Rip" Collins caught a 40-pound, 4-ounce brown trout from the Little Red River below Greers Ferry Dam. The Little Red River begins in the Ozarks and the Greers Ferry Tailwater lies on the eastern edge of the hill country. Before the Little Red River flows into the White River, both streams are part of the flat, rich agricultural land of the Mississippi Delta, and neither smallmouth bass or trout are part of the fishing picture anymore. But between Fayetteville, Arkansas, on the White River and Heber Springs, Arkansas,'on the Little Red River, there are five Corps of Engineers dams—200,000 surface acres of lake above them and 168 miles of trout habitat below them—in the Ozark hills. In this region where millions of years of flowing water created the steep valleys and bluffs that characterize the Ozarks, the problem is not finding a place to fish. It is deciding where to go first.